PLEASE SKIP TO THE END FOR LATEST PROGRESS! 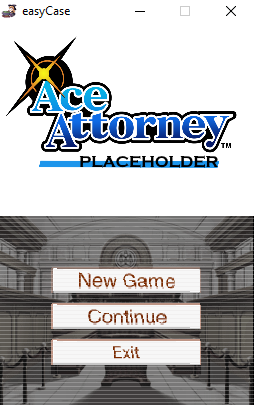 Since the Ace Attorney Discord isn't the best place to post this kind of stuff, and I feel that it's appropriate that people who care know what i'm doing on this project, I'm opening this thread to post my developments on the easyCase framework, built around KSA Technology's previous PWLib library for the Anime Image Game Engine. The feature set here is obviously severely lacking, but it works as a proof of concept. When saved, using the "File" tab at the top of the window, a new instance of PWLib is created in the selected folder, and the script is then flushed to file and can then be run, with no further configuration, from "AIGE.exe" in the save location. Currently you can only set the title, but all initialisation of required scripts, etc. is done by the program itself, rather than by a user manually typing the script in, which I feel is extremely useful. AIGE boots and loads PWLib completely fine from one of these saves. The program also only uses ~20-22MB of memory as of current, which I aim to keep extremely low as to make it lightweight and usable on lots of systems. I'll post more updates here when I have them, and the program is nearing a usable state. In the meantime, have a good one. Last edited by c272 on Mon Sep 24, 2018 7:38 pm, edited 4 times in total. Progress has been made quickly toward a functional build. 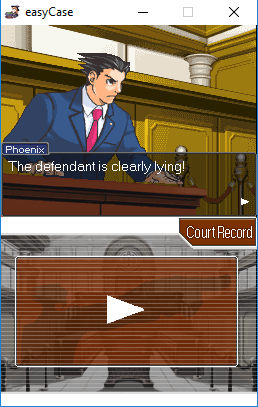 As you can see, development has been extremely limited, and you can currently only have Phoenix as the player character, along with only having 1 or 2 pieces of evidence available. 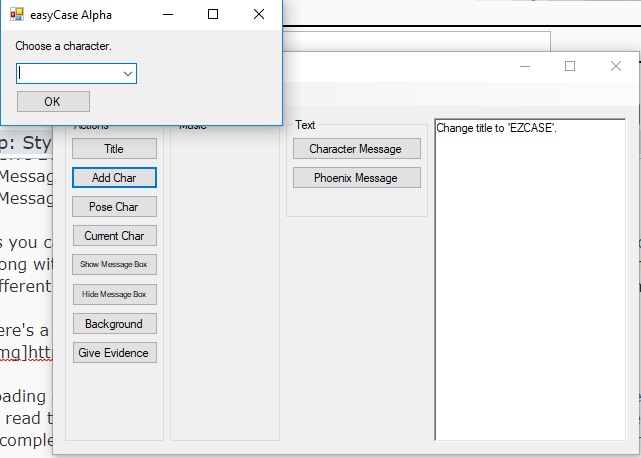 However, this will change when I find the time to add all the different IDs and paths in for all the evidences, and make the player's name changeable. Giving evidence to the player is also done via. 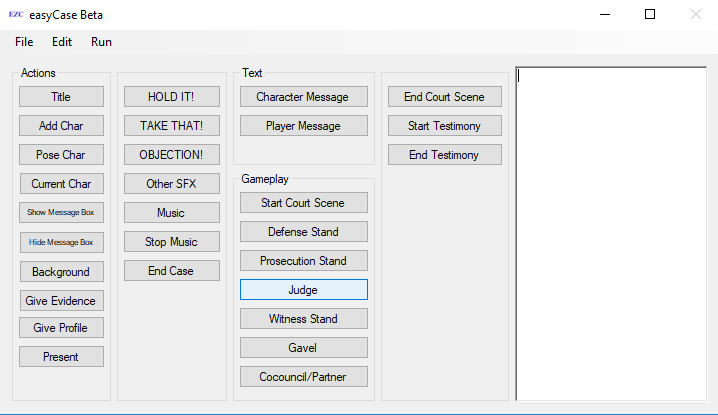 an external window, where you choose which piece of evidence you want the player to have, and give it a description. I'll extend this in the future so that you can choose custom names and pictures for evidence. I'll report back soon with more progress updates, as development continues. Here with a new update again. For this update, I've been ironing out a lot of the problems with text, and finishing off all the messaging features before moving onto the trial and case systems. - Within the parent directory of "AIGE.exe". 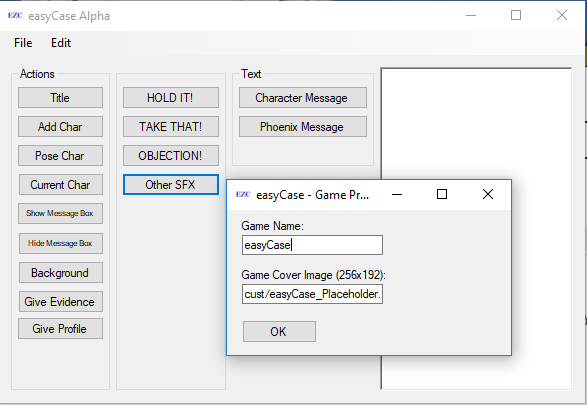 All games created within easyCase now begin with a splash screen and options to create a new game, load or exit. A default placeholder image is used when nothing's supplied. 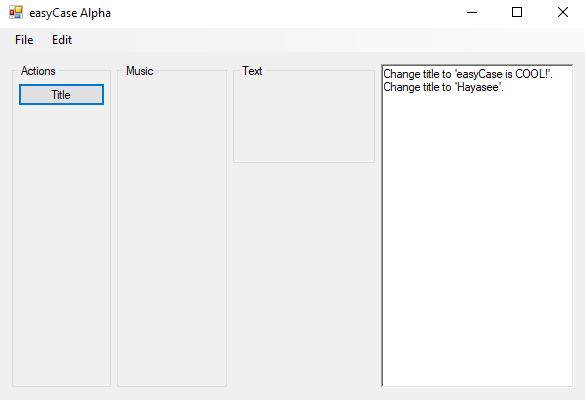 You can now also edit the name of the game, and the name of the banner image, through a "Game Properties" menu in the "Edit" section at the top of the window. A beta build will be rolling out in the other subforum within the next couple days, but on a limited basis. I'll be giving out the downloads on a per-user basis, just for now, so that I can gather testing data and feedback, and then I'll be moving to a global release when I feel that the program's ready. If you want to sign yourself up to the beta program right now, before the post goes live, DM me on Court Records, or contact me on Discord at "king d#4405". Can I signup for the beta program, please? Also, I work on Indian Standard Time so can you respond from 9 am to 8 pm IST? Sure! I'll PM you a link to a one-use download soon, within the next couple days. Looking to get a beta out soon for a group of testers. Just note; you'll need to provide me with feedback, so that I can improve the casemaker (obviously) to participate. If through PM or Discord, it's not an issue. Shot you a PM. Also, I amend that time to 4 pm to 9 pm. easyCase Casemaker's going up for a closed beta. I feel that the feature set's decent enough that I can begin rolling out patches and new releases to a select group of testers, and get sufficient feedback. 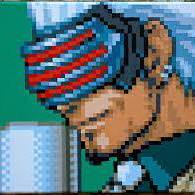 So, I'll be posting to the "Games" subforum for the release side of things, but will maintain this thread for development purposes. - You can now create blank cases and exit via. the "File" menu. The "Close Window" button is now disabled temporarily, as currently, all threads must be manually terminated. Apologies. 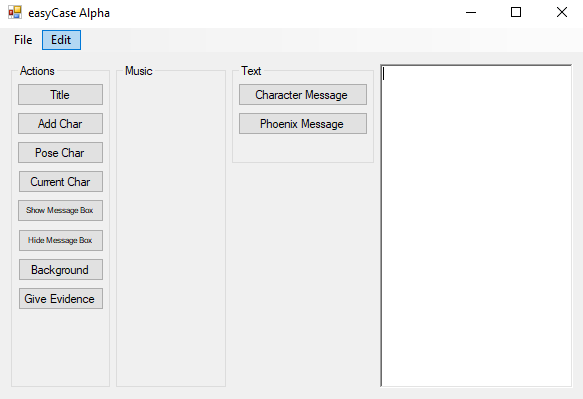 - Music has been added to the GUI! This means that you can now load and stop custom MP3 tracks within easyCase. - Fixed a bug which caused easyCase to crash after a load then a save, caused by an incorrectly placed variable change. 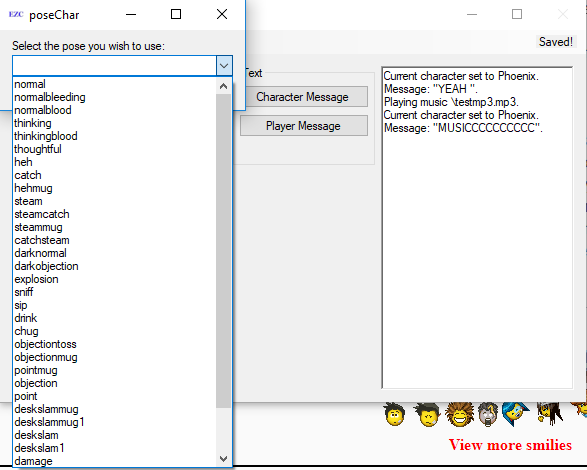 - Fixed a bug with setting the current character in the game causing the name box to be set automatically to Phoenix at certain times. - Fixed a bug which allowed the user to accidentally corrupt their project file by including special characters in their project name. - Fixed a bug pertaining to the in-app news screen, causing it to break and throw an exception. - Fixed a bug which would cause users to stay in an infinite loop if they got the piece of evidence to present incorrect. - Added loading cases into easyCase. You can now load cases that you have previously worked on by selecting their folder in the "Load" prompt menu. This feature will be unstable. Cases may corrupt/function incorrectly after loads at this time. 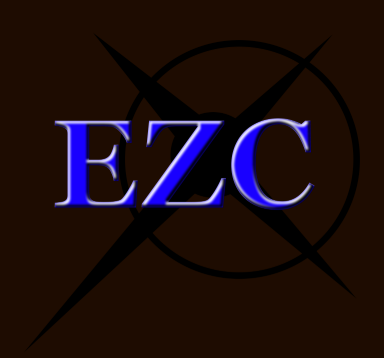 - Added "config.ezc" as a save file to the case directory. If you have an existing case from 0.2.0, it will carry over automatically. - Added presenting evidence! Evidence can now be drawn from the user, when they're questioned on it. If the correct piece of evidence is selected, the trial continues. If an incorrect piece of evidence is selected, a user-defined set of instructions play. - Fixed a bug which allowed users to bypass the evidence present window, thereby breaking the entire case past that point. - Added Trucy Wright and Ema Skye (Young) as included characters for test purposes. You can now also hold conversations between two onscreen characters as a result. 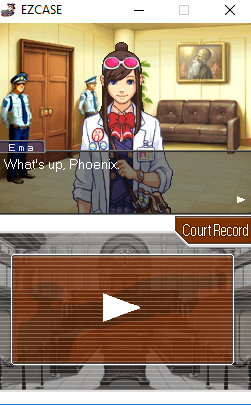 - Fixed a bug which caused Trucy's name box to display a blank piece of text when used directly after evidence. There's also a revamped error message system, which shows a popup rather than writing to the console box on the right, and contains a little Magatama symbol. Cutesy. Anyway, I hope to see you all over on the beta release thread for signups soon. For anyone who's testing the program, a feedback form will be sent to you along with the release! I've been working on improving the memory management inside easyCase, and have changed from using Lists and Timers to ObservableCollection modules. This has greatly decreased the memory requirement from 0.2.1's release, as seen below. The previous easyCase program used anywhere between 50 and 60MB of RAM. Now, the requirement is around 30, which is up to a 50% usage decrease! 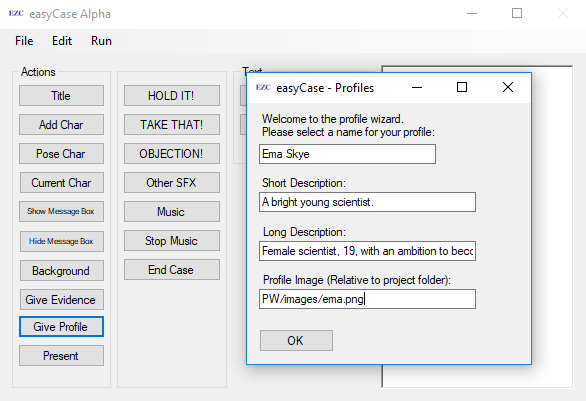 You can now also run your program from within easyCase, which will be an easier method to launch games. That's all I have for now, but I'll be back soon (maybe later today) with some more codebase updates. Update II: Undo function + more! - You can now pose characters, with nearly 400 poses added. 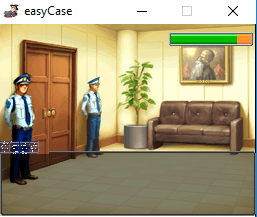 - You can now finish a case using the "End Case" button, to add the correct footers. Here you can see the "End Case" button. The new custom profile system. As mentioned, this update will drop on Sunday, as the 0.2.2 beta release. Posing of characters has also been added, with nearly 400 available poses! I've also fixed the problems that occurred with the "Music" tab, where it would not play properly. This was due to weird formatting bugs in WPF, and is eliminated in this update. It's some under the hood stuff, but 99% about adding features back from the AA Trilogy, which is basically done. That's all for now, but I'll be back soon with more development updates. 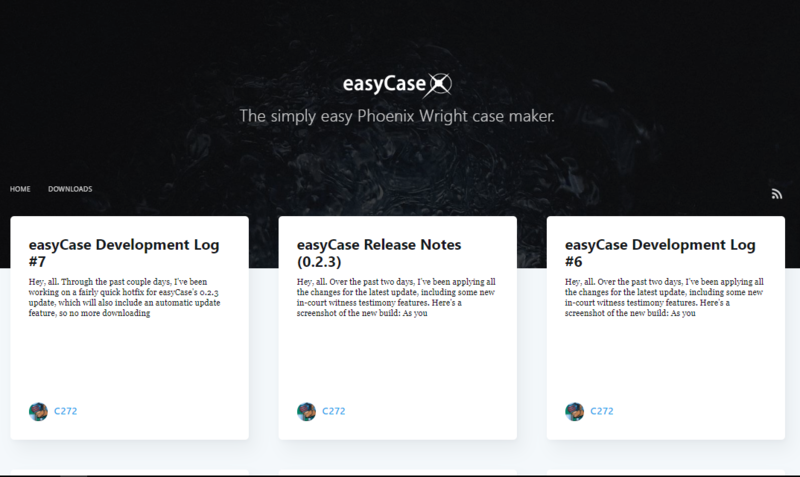 Footnote: There are also tutorials on the way for how to use easyCase effectively, coming through the Ace Attorney Casemaker Discord. They'll be posted on this thread, too. Hey, all, I'm back with another development update. Things have been moving quickly with the current beta testers, and I've managed to identify and close a lot of bugs. Now, I'm starting work on the court system, which will likely be out before next Monday! This will obviously introduce new issues, so my #1 priority is working on squashing all the current ones. 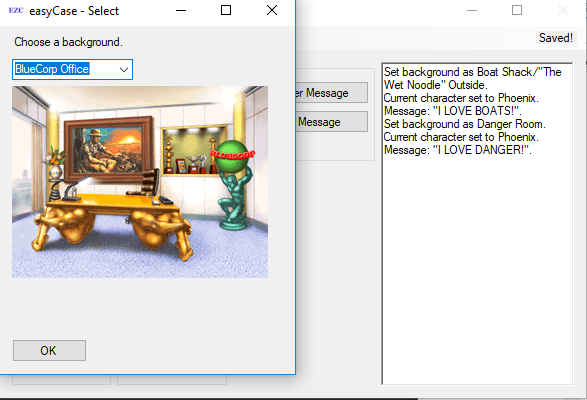 - Fixed LNK file formatting with descriptions. - Fixed an issue upon first save which would cause the program to crash. 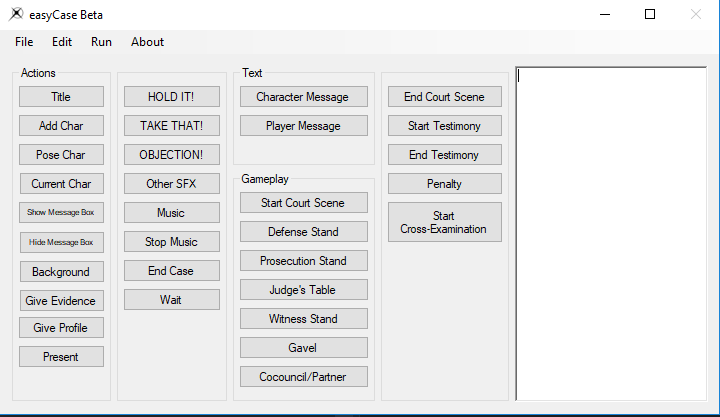 - Fixed that in-court sprites were appearing as options for outside of court. - Destroyed a bug which made some cases start with an error message. - Added the full trilogy character set back into the files. 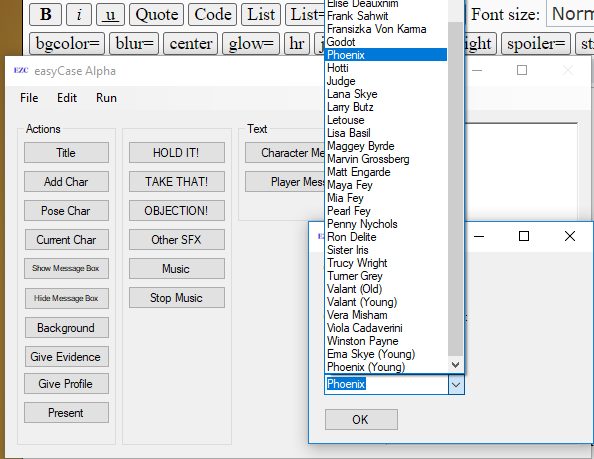 - Fixed many formatting errors within character/background files. - Prepared configuration for upgrade to PWLib 1.2. This will expand with more features as I work on the court system. For now, this is a little update. Hey, I'm back with another weekend update. 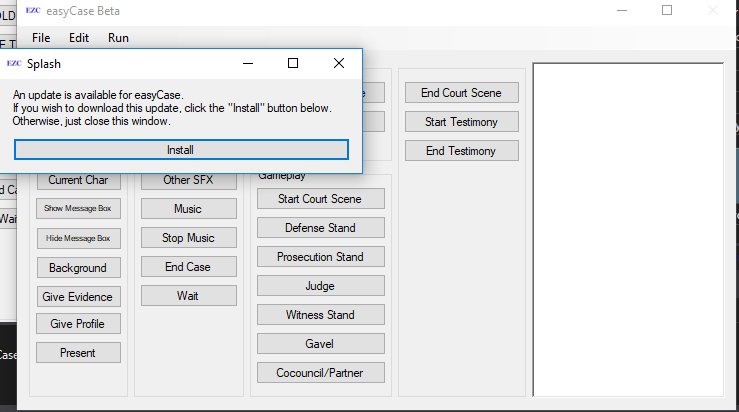 There are also some new buttons, allowing you to start and stop courtroom scenes, and to switch to different areas of the court, bang the gavel and look at the co-council stand. 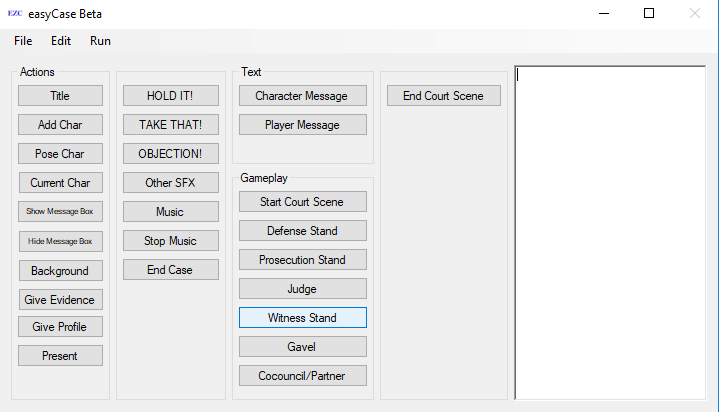 This is the start of the actual court system in the game, and there's still a massive empty column on the right that I'm going to fill with features shortly! Here's a quick look at a court scene in action. Over the past two days, I've been applying all the changes for the latest update, including some new in-court witness testimony features. There are also a further ~350 poses added to easyCase's pose editor. Additional to this come some further bug fixes to those mentioned in the previous update. 0.2.3 goes live on Sunday, at 7:00PM GMT! A quick update to note that 0.2.3 releases today, so go check out the full changelog over on the release thread! Incoming Hotfix + Minor Update! Through the past couple days, I've been working on a fairly quick hotfix for easyCase's 0.2.3 update, which will also include an automatic update feature, so no more downloading zip files over and over again! Development on that went slower than expected, though, so I'm going to bundle it with the release of the next minor update, which will be releasing on Sunday at 7PM GMT as usual. 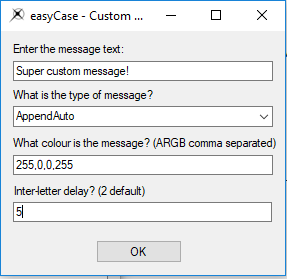 - An auto-update tool is now bundled with easyCase, which should make it easier to patch the program in following updates. This is mainly a behind-the-scenes update so far, but I'll be fleshing out the features list through Friday and the weekend to get the patch out there on Sunday. Hotfix Final Changelog + Website! - The easyCase website is now up for beta members, at http://easycase.me. And this is a full disclaimer to everyone that's downloading the software from here on out; the program now has networking capabilities, and connects to a remote server. This is so it can check for new updates and grab news, but it still fully works when you're offline. Unfortunately, that's all for this week. I've been extremely busy doing external things, but I'll be back on development toward a public release, hopefully around 0.5.0. Hey! I'm back with the final changelog for the 0.2.4 release, going live in about an hour. Here's the full list of changes, straight from the horse's mouth. That's unfortunately all for now, but you can also check out the changes when it goes live again (if for some reason you want to) on the release thread. It's pretty obvious what the new button is, considering its massive on-screen size. This allows you to start a cross-examination in the court room, after a witness has given testimony (or at any time in the court, technically you could get the judge to testify). 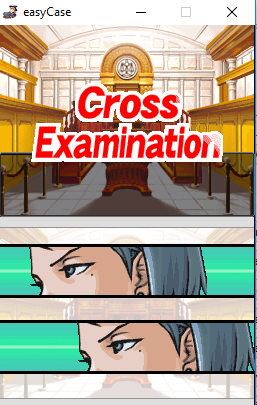 When starting your cross examination, you can also pick the name of the testimony, and the prosecutor/attorney who are facing each other off on the start screen. Bear in mind that if you pick two prosecutors or two attorneys, they're going to be facing the same way, so it's not always an optimal choice. This may be patched out in a later update. Ignore the glitching in the character box, that was my experimentation into custom characters (more on that in a later update). However, that's all I have to show for now. I'll be back in a few days with more updates on development. I've decided to delay this week's release to next Sunday, as I feel there just aren't enough features added right now to justify a full beta update. Unfortunately, as I get closer to my exam period (2 weeks away now), I've found that making updates to the program has become harder and harder. When my exam period starts, and for the four-ish weeks that they continue, I'll be making no updates to the program. So, 0.2.5 will likely be the last update before a one month hiatus. After that, however, I have a large break period, meaning I'll be able to update the program many more times over the 4-5 months afterwards. Apologies for the delay, and the hiatus, but it's the only way I'm realistically going to get my thesis and course through with a pass. I have returned from my multiple month hiatus! It's been a while longer than I expected for a myriad of reasons, but I have returned to work on the project. During my away period, I realised that the GUI for easyCase is currently extremely confusing, as well as the code being sloppy in places. So, I've decided that the next major update (0.3.0) will be a complete code and GUI refactor, essentially rebuilding the program from the ground up with a better base. All features will stay intact, don't worry, but it will take a while to complete. In the future, it will make development 100x easier, and that's something I want to keep in mind when developing this tool. Many thanks for following the development of easyCase. im so excited with this update! This will make them slightly slower to access, but it'll make it very much easier to understand, in keeping with the name. Y'know, "easyCase" should be easy to use. There's also now a custom background selector, which means you can finally load some sort of custom image into easyCase. Characters will be coming soon, but aren't finalised yet. And now, arguably the star feature. 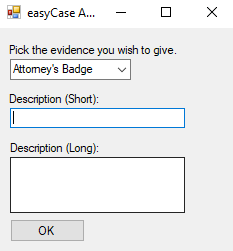 You can now export your finished cases to a .exe file to share with your friends or strangers on the internet! This is done through the use of Self Extracting Executable Files, or SFEX files, so you must have enough space on your hard drive available to store the executable file twice. If you reach this boundary, which shouldn't be too hard, you can then take and play your cases anywhere, portable. This also makes the speed for transferring the game across hard drives etc. much faster, as it's only a single file, and allows for compression, which will reduce download sizes. The "RAR" and "ZIP" options are not available yet, as again, I didn't have time to implement them in time for this release specifically, but they'll be available in 0.3.1, or 0.3.0a. Finally, there's also now a "Help" tab in the context menu for tutorials and other resources about easyCase, when they become available. The documentation will be constantly updated by me and possibly others over the coming months. As this is a solo project, it might be slower to update than other docs. That's all I've got for this release, along with the minor fixes mentioned in the changelog, so I'll be going. Thanks for following the development of easyCase. wow easycase 3.0 is amazing! And welcome back, after a non-eventful 2 months of waiting. 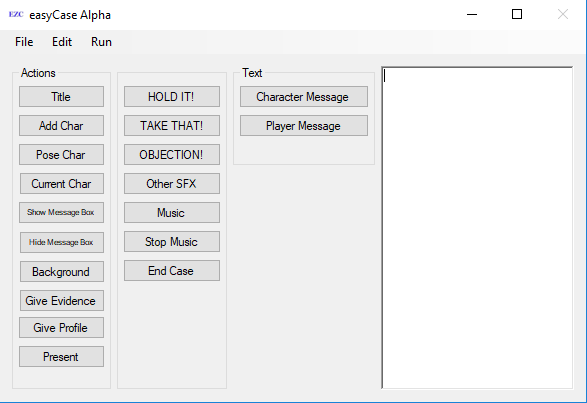 - Complete overhaul of the console, including a new context menu option and non-erasable text. - Added a new custom dialogue feature, which allows for colour variants and different text types. - Added a “Hide character” function for ease of use. - Added a new “Delete” and more context options for individual commands in the easyCase console pipeline. 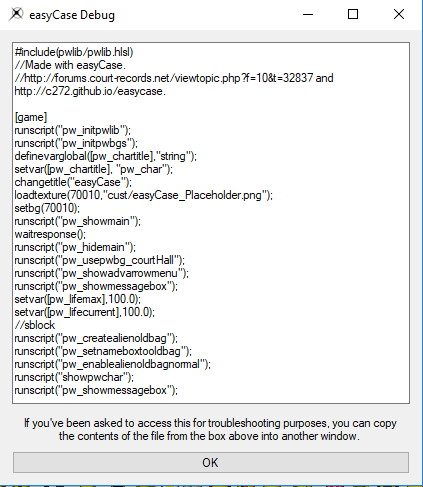 - Added a new debug window for troubleshooting while using easyCase. 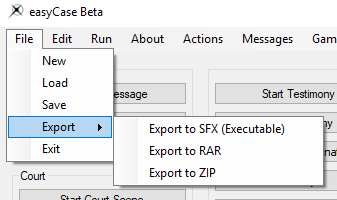 - Finished the 7Z and ZIP options to export, as well as EXE. - Changed the layout of the main screen to be more compact, and allow for more features to be added later. 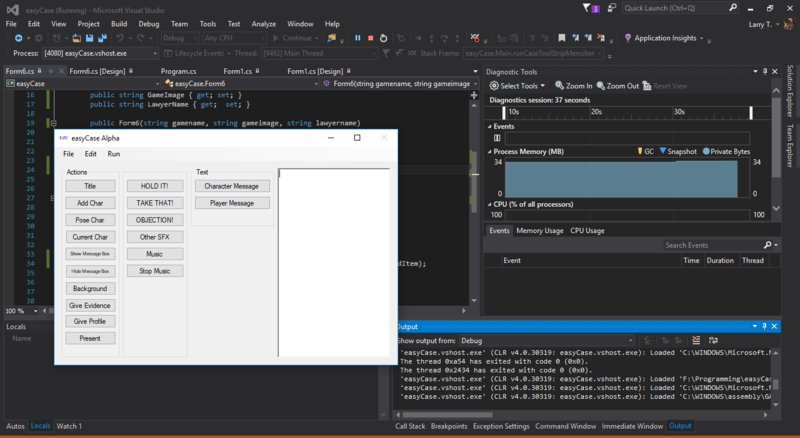 - Integrated the DLL dependencies into the program executable, so they no longer have to be included with the program. - Fixed a bug where you were unable to continue a court case after opening a saved project. - Changed the window elements so they will scale properly on large monitors. 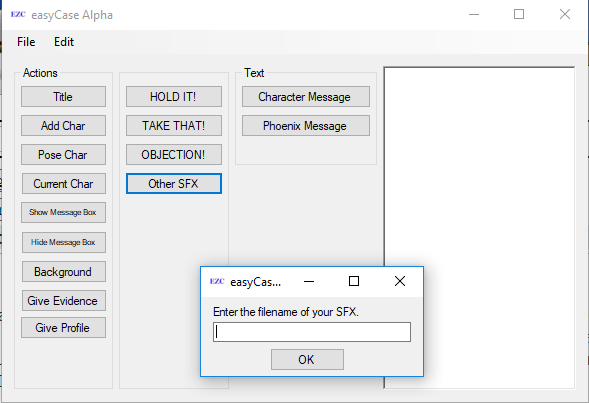 - Options for text alignment, color, and shaking/flashing. 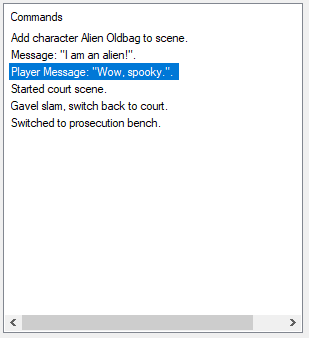 - Fixed an error where the first item in a court scene would not be blocked out correctly. - Added a loading bar to exported executables. - Migrated the court location changer into a combo box to avoid needless spaghetti code. - Changed the court location selector to not allow you to go to the same location twice. 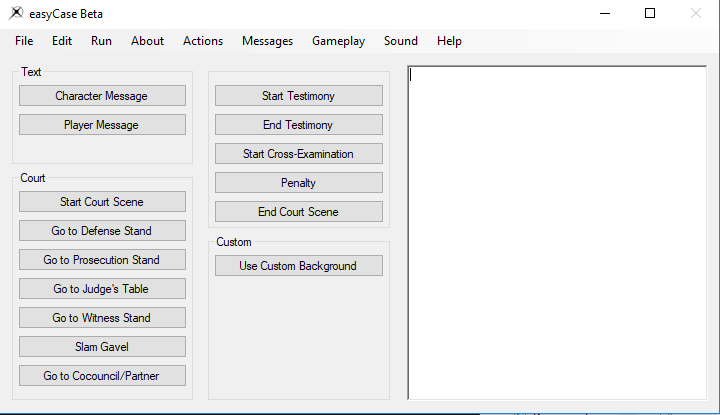 - Updated some developer-only flags and functions pertaining to the court movement system. - Swapped the “version” text on the about screen to “build” text for reduced clutter. 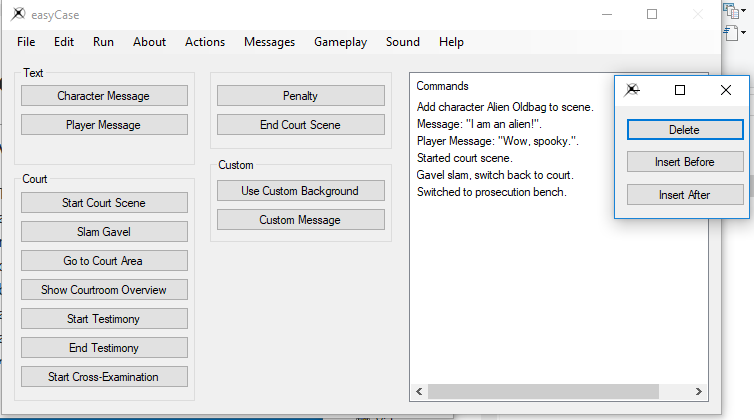 - Fixed a bug where a gavel hit would not register after first starting a court scene. Here's a quick overview of some of the new features in action! First, the brand new command menu, which lets you delete and fine tune your earlier code without having to restart, which is a feature I was really relieved to finally push. As you can see, commands can now be individually selected, and commands inserted before/after that point. They can also be deleted via. the context menu, regardless of where you are in the editor. 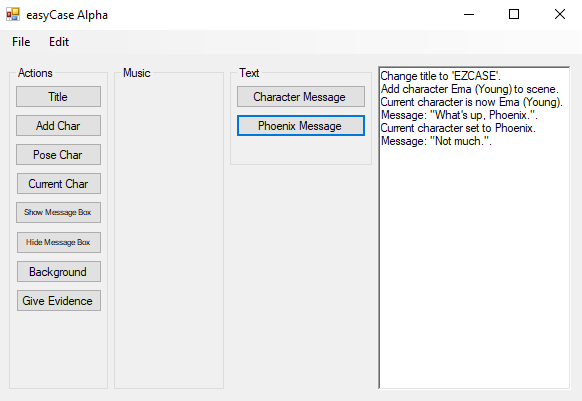 The custom dialogue option has also now been finished, so you can select the colour of text, the type, and more when creating a message. 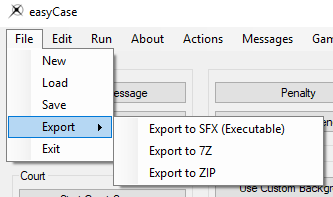 You can now also export in 7Z (7Zip) format, as well as standard Windows .ZIP files, through the default "Export" tab, under "File". So, now you can easily package your project without being forced to use an executable format, or copy it directly out of the project directory with unnecessary easyCase-only dependency files included. 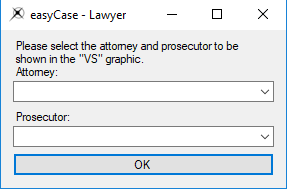 That's pretty much all there is to showcase for this update without spoiling it too much, and a larger update will be coming soon that introduces a graphics system for storing images in easyCase to use for courtroom overviews and eventually... custom characters. That's all for now though, so have a good one. A quick update on the development of the program, as I realise this thread's been dark for some time. Development is 100% moving forward, however I'm working on reformatting and preparing for PWLib 1.2 in the background, as details on development are very scarce, even inside the dev circle. I'll have an update probably within the next few months which will get the program up to date and running with the latest features, but I'm in a sort of buffer zone where I don't really know what to do. See, if I continue developing for 1.1, then the program will become outdated immediately upon release of 1.2. However, trying to develop for 1.2 is literally impossible, since I don't have access to the source code or any documentation regarding how scripting has changed, so I'm just working on the core systems of the program. I hope you can all understand, and I apologise for the delay. Another update on the state of the program. Currently focusing all my effort on getting the 1.2 version ready for release alongside the engine itself, so there have been literally no public updates, as it's all gone closed doors. Just a bump to let everyone know the program's not dead. Also, codebase is a lot cleaner now, so that's a plus!